GameCube is in my house. Animal Crossing and Super Smash Bros. 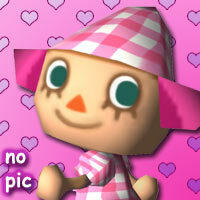 Both are entertaining and in Animal Crossing the villagers are funny and cute. No colour, it's not mine, I own nothing. Oh yes I own one controller!! It has transparency which is always great. I like nice looking characters (like in Zelda Wind Waker) and interactivity, the game world feels real and you don't face tons of bugs and obstacles all the time. Interesting and original ideas with smooth gameplay and good rhythm. Enthralling atmosphere. I'm not totally into the design of the console buttons, but it's ok. Some games are a bit stupid, but luckily I dont need to play them. I dont really like Luigi and Mario and DONKEY KONG (and all his dreadful relatives), their design is a bit ugly (men with moustache are not great in 3D). I preferred the old 2D Super Mario Bros. games to the recent ones, where you never know which direction you have to go to. Maybe I havent played enough though. An evolved version of Animal Crossing, where you could actually have a conversation with the animals. And maybe some cool spy game, a little bit like Perfect Dark, preferably not very disgustingly violent. I dont remember, so I suppose it means there's none. If you want to buy a game console, if you are smart, you support the company that has started it all and not the lame copycats. If they are not well-known I dont know them either... But I would like to know what the square animals game is all about. Also, I would like to tell people to play Doshin the Giant when they are stressed out. It's relaxing. Yes. Read all of my previous answers and you will find the key to the new-found success! Or maybe not. At least, dont fall into the stupidity of other game makers by starting to make sexist games to draw the attention of lame males with just one brain cell. They are not worth such effort. Make games for smart people who appreciate imagination and individuality. Interview done on January 31, 2005.